From me to you from my garden. There is the true joy of life; to be used by a purpose recognized by yourself as a mighty one; to be thoroughly worn out before being thrown on the scrap heap; to be a force of nature instead of a feverish, selfish little clod of ailments and grievances complaining that life will not devote itself to making you happy. I am a wife. I am a Mommy. I homeschool. I have a little shop allows me to stay home with my kids but doesn't make quite the scope of difference in the world that my job as a classroom school teacher did. I have many friends that I see often. I enjoy having people into my home. I give my little bit of money to things I believe in. I live passionately, though my scope is small - narrowed to my family and a few friends and neighbors. I cannot seem to even keep my house clean. I create small pockets of beauty around me. I adore my children. I like to garden in my small yard. Though my sphere of influence is so very small, I still believe my purpose and the place God put me is a mighty one. I throw myself into it and choose joy in all of it. I am quite satisfied with my lot in life. He has been so very good to me. Today we homeschooled, enjoyed Daddy before he left for work, made paper bag turkeys, had soup for lunch, went to Walmart, sewed together some fall leaves for a garland with Hunter's help, decorated the mantle for Thanksgiving, made "give thanks" jars, got out the stamps and made Xmas tags, thought about baking cookies (tomorrow), played with Tessa to get her to laugh, cleaned the house, did dishes, had breakfast for dinner, read books, burned a hazelnut candle, danced to old CD's that the kids discovered, did goodnights, sat down to read favorite blogs on the computer, wrote this blog post, and am thinking about sewing a pair of shoes . Friday it was 90 degrees - in November! Truly! Then it rained over the weekend. Today was cool and windy. I am joyful for little things. Like the fact that the weather calls soup again. 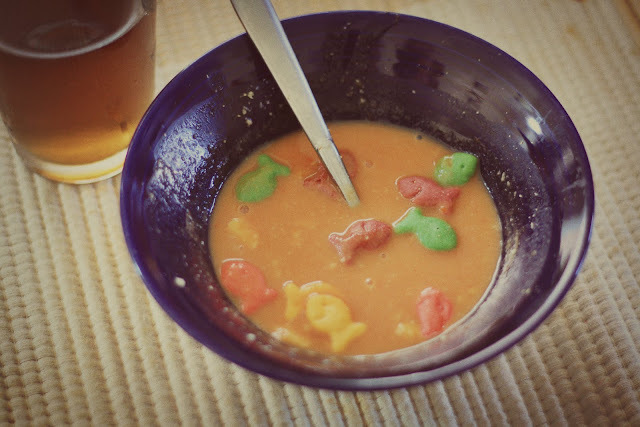 Today's lunch: Tomato soup and gold fishy crackers. Childish? Perhaps. Enjoyable? Yes. Though it was not too cold for iced tea (according to me who drinks it all year long). Ainsley loved this lunch. She also likes my unsweetened ice tea. Weird for a three year old. Don't judge. It was decaf. This made me smile. I often feel like our life is pretty mundane (minus all the wildlife and such), but I couldn't be happier and wouldn't trade it for a thing! 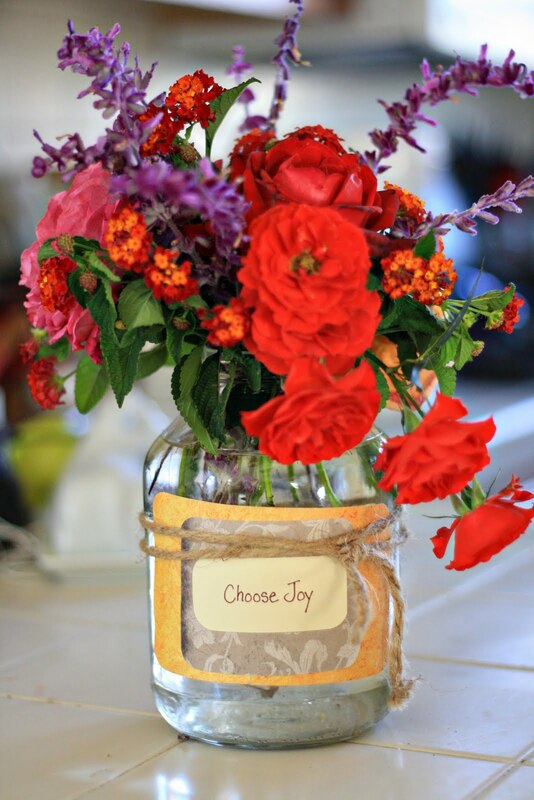 Those flowers are gorgeous and the tomato soup with the fish crackers made me laugh!